So Wednesday evening I made my way with my friend to Springwood in the Blue Mountains for a couple of days. Had an excellent Ausi barbi that evening and made to feel very welcome. 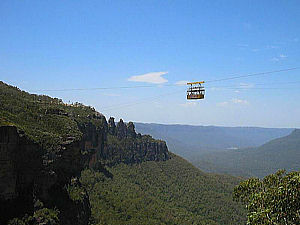 The Blue Mountains, you couldn't get anything far different from Sydney if you tried. Alot of bush and very changeable weather as I was greated with when I woke up Thursday morning!!! Nothing but rain and drizzle and a VERY thick layer of mist!!! We tried some of the tourist veiw points but you couldn't see more than a foot in front of us!! So the only thing a girl can do in this situation is to shop!!! My friend dropped me off in Katoomba and I wondered around the shops. A small town but quaint little shops to wonder around. But while I was there I did book a horse ridding day trip for the Magalong Valley the next day as the weather promised to improve! From there I took the train to Leura and came across another small town with little shops, one being a Christmas Shop!! Didn't go in there! WHY! But there was the most amazing sweet shop with every sweet you ever had as a child. Lots of stuff from England and all over really, floor to ceiling sweet jars, you've got to see it to beleive it. Friday came and it was an early start to get the train to Blackheath to get picked up to the Megalong Valley farm for my horse ridding day. What a beautiful place and bonus was that there was only two of us on the ride so it felt like we had the whole valley to ourselfs. Well the weather changed to hot! But what a toatally amazing day, the veiws were spectacular, great horses not too ploddy and got some seriouse cantering done also we saw wild grey kangaroos brilliant. We started about 9.15am and didn't stop until lunch at 12.30pm, where we sheltered at the bottom of the valley next to Cox's River, which is more like a stream now because of the lack off water they have not had. Just an hour for lunch but time to get a paddle in the river to cool my feet. Then back on the horse, oooh! I was starting to feel it now, then a slow walk back to the farm. We arrived back at 3.15pm, so it was a good ride. Friday night my friend and I hit one of Springwoods two pubs! Deffinately an experience and for my friends back home in the village I met Don's younger equivilant Ahhhhhhhhhhhh! but with more teeth. But still a good night. Saturday better weather again and my friend and I went off to visit some of the views that I couldn't see the other day and took photos. Basically a chilled out day. Sunday I went with my friend and some of her other friends to the Botanical gardens in the Blue Mountains for a picnic lunch. Amazing gardens, good food and great company basically sums up the day. Monday came and it was time to move on. An early start in order to get the bus at Sydney on to Canberra, I was starting my travels.